Black holes come in a range of sizes, from star-massed ones of a few solar masses to supermassive ones containing millions, sometimes billions of solar masses. Recently, we’ve found one on the larger end of that range, with a mass of about 12 billion Suns. While we’ve found other black holes of similar mass, this one is unusual because of its distance, and it has us scratching our heads a bit over just how it formed. The black hole has been observed as a quasar with a redshift of about 6.30. 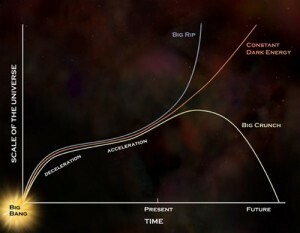 This means the light from the quasar has been traveling for about 12.8 billion years. You might think that means it is 12.8 billion light years away, but due to cosmic expansion it’s actually much more distant. 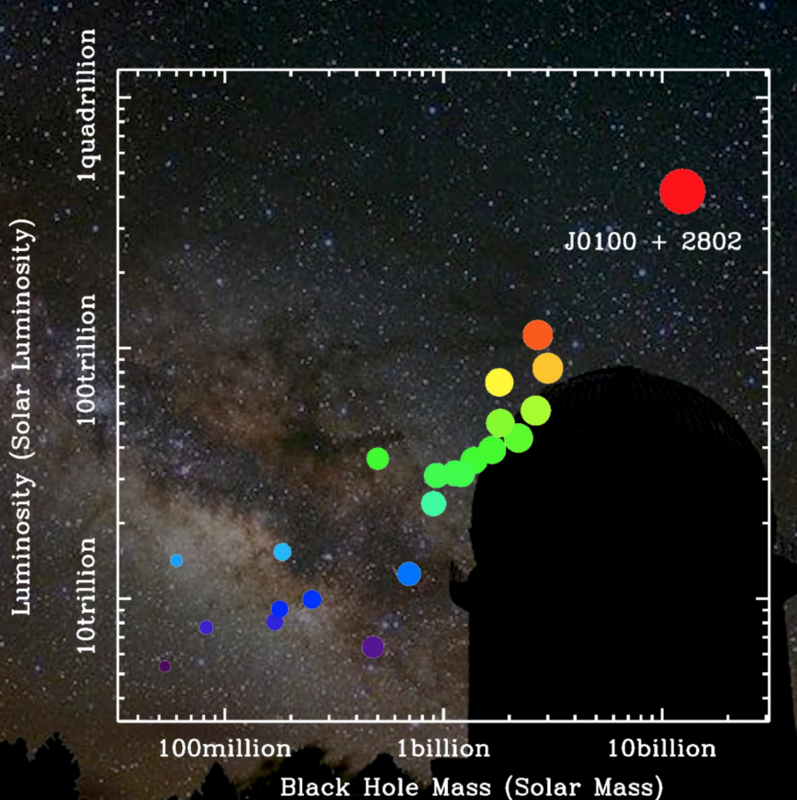 With such a high redshift, the light we observe is when the observable universe was only 900 million years old. It’s also the brightest quasar ever discovered. So how did such a massive black hole form so early in the universe? A black hole could achieve its size by capturing matter at nearly the maximum rate for a black hole, but it’s so bright that the radiation it gives off would work to limit the rate at which surrounding matter could be captured. A more likely scenario is that the black hole is a result of a merger between two supermassive black holes. At this point we aren’t sure of its origin. But having such a bright quasar so far away does have advantages. 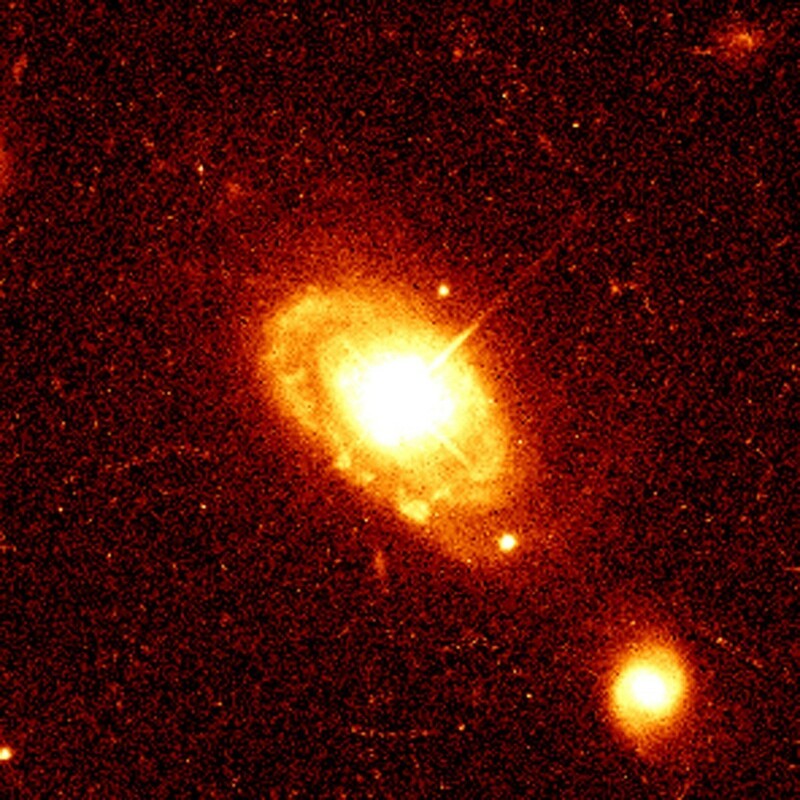 Since the light of the quasar travels a great distance to reach us, we can use bright quasars like this to study any gas and dust between it and us. This particular quasar will let us study more distant material. Just a silly question: How do we know that super massive Black Holes didn’t always exist, even during the very early stages of the universe? How do we know that they needed to collect all their matter to grow to the size we observe instead of starting of massive straight from the beginning of the universe? Some black holes might have formed very early on, but the real question is how they might have gotten so big so fast.